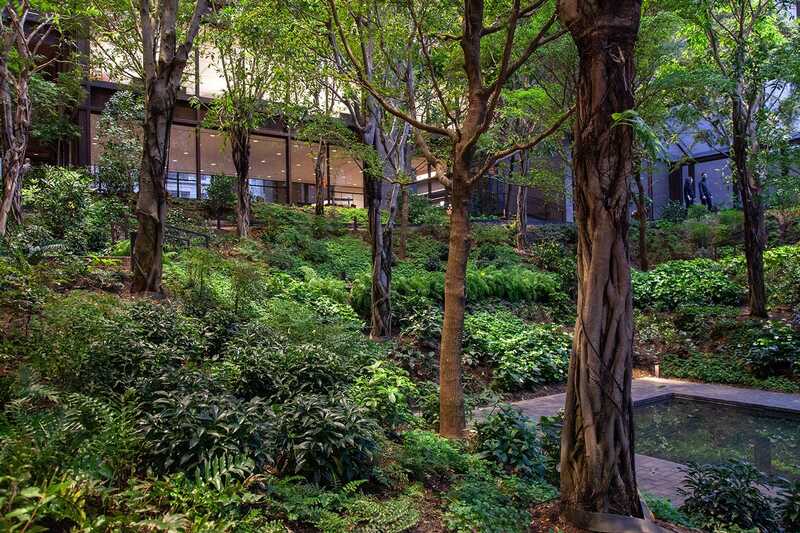 The Ford Foundation for Social Justice headquarters building, designed by Kevin Roche John Dinkeloo & Associates in 1968, included a 9,000 square foot, 160 foot tall Atrium garden designed by Dan Kiley. The Foundation’s mission-driven renovation modernized the building and also included a renovation of the garden to restore the spirit of the original Kiley design. Kiley’s original design intent had been degraded throughout the years due to pests and environmental conditions. Kiley’s design distanced him from the orthogonal layout he was known for by paying homage to the New England forest. His plant selections maintained open sightlines for transparency and light penetration, complementing the Atrium’s monumental scale and creating an intimate garden experience. The collaborative design team, led by Raymond Jungles, Inc. with SiteWorks and James Urban providing technical know-how, worked to restore Kiley’s vision and maintain his intent, despite the challenges of restoring a garden inside a landmark building.